The next hike of the 2015 summer season is within South Valley Park near Lockheed Martin. 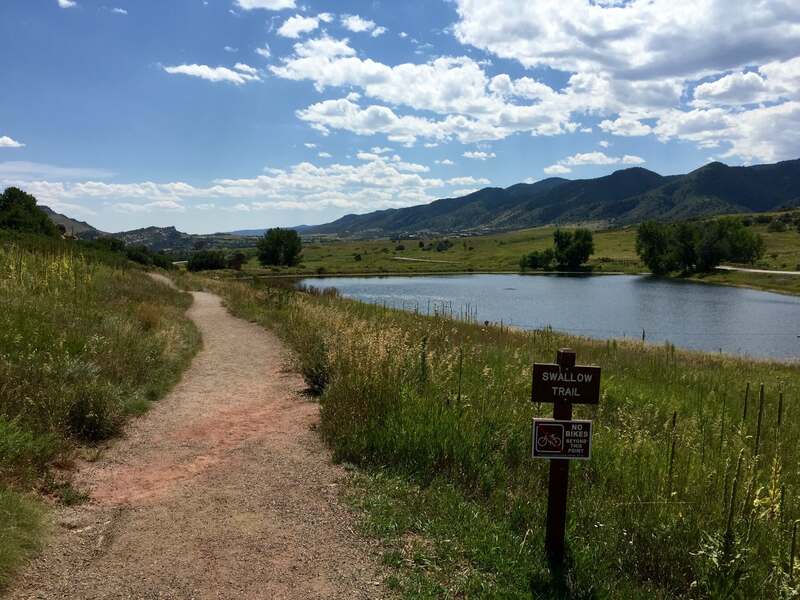 You can access the park from South Valley Road or Deer Creek Canyon Road which is the shorter drive (about 20 minutes) from Roxborough. Heading north on Wadsworth Blvd, take a left onto Deer Creek Canyon Road just before the 470 ramp. Stay on Deer Creek Canyon Road for about 3 miles. The parking lot will be on your right hand side which has a dozen or so parking spots and a portable restroom. A larger parking lot, restroom facilities and drinking fountains are located on the other side of the park off of South Valley Road. The trail described below will bring you to to the other parking lot in about 30 minutes but make sure to have enough water at the beginning of the hike as the trail is exposed and very few shaded areas are available. There is only one trailhead from this parking lot so there’s no confusion as to which direction you’ll need to go. You’ll reach the first trail junction 0.4 miles into your hike – turn right and continue on Coyote Song Trail. Another 0.4 miles and you’ll reach the trail junction to Lyons Back Trail. This quick 100 foot elevation gain takes you through some scrub oak before you get views of Lockheed and Deer Creek Canyon Park. Lyons Back Trail will lead you to Ken-Caryl Foundation trails so you can continue in this direction if you are looking to lengthen your hike. If not, snap a couple pictures of the view before you head back down to rejoin Coyote Song Trail. Another half a mile down the trail, through beautiful red rock formations, you’ll come to a couple picnic shelters. This is a great spot to take a snack or lunch break. You’ll also see the other parking lot so if a restroom break or drinking water is in need, now is the time to make the short detour before finishing the remainder of the hike. After leaving the picnic area veer left onto Swallow Trail. This portion of the hike also provides stunning views of the red rocks. After about a mile you’ll join back up with the Coyote Song Trail which will lead you back to the parking lot.